1. 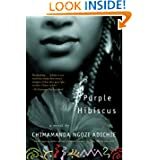 The first line of Purple Hibiscus reads, “Things started to fall apart at home when my brother, Jaja, did not go to communion and Papa flung his heavy missal across the room and broke the figurines on the etagere.” This harkens back to Achebe’s most widely read book in African literature, Things Fall Apart (also reminiscent of Baldwin’s American classic Go Tell It On The Mountain). What is falling apart in Jaja and Kambili’s family? Why? How does religion and belief impact family dynamics? 2. How does the atsmosphere in Aunty Ifeoma affect Kambili? Why is it so surprising to her to hear people speak, laugh, and argue so freely? How does this help her regain her own ability to speak, and, most importantly, to laugh? 3. When Kambili hears Amaka weeping after her grandfather’s death, Kambili thinks: “She had not learned the art of silent crying. She had not needed to” [p. 185]. What does this passage suggest about the differences between Amaka and Kambili? In what other ways are Aunty Ifeoma’s children—Amaka, Obiora, and Chima—different from Kambili and Jaja? 4. Amaka says, “Uncle Eugene is not a bad man, really. . . . People have problems, people make mistakes” [p. 251]. Is he in fact a “bad man”? Why does he violently abuse his wife and children? What good deeds does he perform? How can his generosity and political integrity coexist with his religious intolerance? 5. In what ways are Aunty Ifeoma and Eugene different from one another? Why is Ifeoma so much happier even though she is poor and her brother is rich? How does Ifeoma’s work at the university affect her attitudes toward life in Nigeria? 6. Eugene boasts that his Kambili and Jaja are “not like those loud children people are raising these days, with no home training and no fear of God”; to which Ade Coker replies: “Imagine what the Standard would be if we were all quiet” [p. 58]. Why is quiet obedience a questionable virtue in a country where the truth needs to be spoken? In what ways is the refusal to be quiet dangerous? 7. What kind of man is Papa-Nnukwu? What are his most appealing qualities? What do the things he prays for say about his character? Why has his son disowned him so completely? 8. How does Father Amadi bring Kambili to life? Why is her relationship with him so important to her sense of herself? 9. Jaja questions why Jesus had to be sacrificed, “Why did He have to murder his own son so we would be saved? Why didn’t He just go ahead and save us?” [p. 289] And yet, Jaja sacrifices himself to save his mother from prison. Why does he do this? Should this be understood as a Christian sacrifice or a simple act of compassion and bravery? 10. After Aunty Ifeoma moves her family to the United States, Amaka writes, “there has never been a power outage and hot water runs from a tap, but we don’t laugh anymore . . . because we no longer have the time to laugh, because we don’t even see one another” [p. 301]. What does this passage suggest about the essential difference between American culture and African culture?